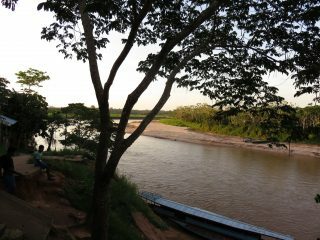 Sustainable Amazonian Landscapes | » How much carbon is stored within the transformed landscapes of the Amazon? How much carbon is stored within the transformed landscapes of the Amazon? Within the project “Sustainable Amazonian Landscapes” (SAL), we are going to answer this question by using test plots to estimate the amount of carbon and vegetative biodiversity that exists under different land use scenarios present within the anthropogenically transformed Amazonian landscapes of Peru and Colombia. 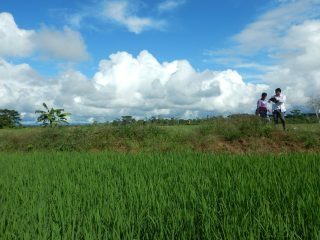 The fieldwork for this work began this past May and we expect to finish in September of this year. This activity is a joint effort between the organizations CIAT, SINCHI, CIPAV, UNIAMAZ, IIAP and UNALM, falling under the framework of the project “Sustainable Amazonian Landscapes”. All of these organizations have made their expertise available in order to develop a common methodological approach to estimating the carbon content of aerial biomass, soils, detritus, and fallen leaves, for use within the project worksites of Caquetá, Colombia and Yurimaguas, Peru. The hilly landscape corresponds to the beginning of the Amazonian plains, it has a flat to rolling terrain and the predominant land use is as pasture for extensive livestock farming. It is present in the municipalities of Albania, Morelia, and Belén de los Andaquíe. The alluvial (floodplain) landscape is made up of recent alluvium sediments which have been deposited by river flows. This landscape includes all flatlands with slopes less than 2% that annually suffer periodic flooding. Terrestrial ecosystems play a significant role in the global carbon cycle. 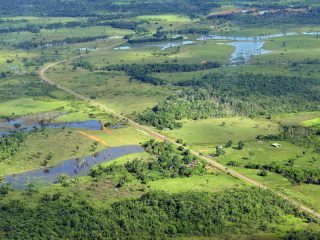 Tropical forests account for the majority of carbon storage and exchange between vegetation, soils, and the atmosphere. However, changes in land use through deforestation processes – wherein forests are transformed into pastures and farmlands – have been for years one of the principal sources of carbon dioxide emissions (carbon dioxide being a greenhouse gas which contributes enormously to global warming). The project SAL seeks to generate scientific evidence that would allow us to understand how ¬– through agroforestry strategies and the implementation of more sustainable and environmentally friendly production options – it can be possible to go back to increasing the carbon reserves of the Amazon’s degraded landscapes, which for centuries were dominated by natural forests and now are a heterogeneous covering of forests mixed with secondary vegetation, pastures, and farmland (Figure 1). Figure 1. Carbon reserve amounts throughout the processes of reforestation and deforestation. The wild flora of this region is very diverse and for centuries has provided a series of benefits to both natives and settlers. This is why it is fundamentally important to determine the biological richness of these landscapes aside from just their carbon content. Applying the experiences of SINCHI and IIAP, the project is advancing with the measurement and characterization of vegetative biodiversity within the prioritized landscapes. This measuring is carried out beginning with floral studies using floral diversity as the principal indicator, from which it is possible to find out the density, abundance, dominance, ecological importance and even the capabilities of species useful as medicines, fibers, decorative materials, and foodstuffs. What do the farmers think of this work? The agricultural producers within the study areas have been very receptive to the work and have participated in an active manner in all of the activities undertaken so far. Starting in the beginning with the process of mapping boundaries and land covers of their farms, to the co-design and implementation of more sustainable production systems, the sampling of soils and macrofauna, the selection of isolation and conservation areas, and now with the establishment of plots targeted towards carbon and biodiversity, the producers have always been involved. It’s possible that before, the producers had not heard the terms ‘carbon’ or ‘biodiversity’, but regardless, they are absolutely aware of the importance of the forests and secondary vegetation in the provision of ecosystem services for the local population, as well as understanding of how the process of deforestation directly affects their well-being.